Thread: Why do we read superhero comics as opposed to Star Trek? I agree, which leads to the question of why we would read super hero instead of ST. I think, as someone said, it's wish fulfillment, as in, I'm a superhero, someone special, as opposed to a flunky in uniform on a star ship. I think more people would rather have the ability to level a city with their thoughts (or fists, or breath) than they would the opportunity to live in a utopian society. Wish fulfillment. Even some of the heavy stuff is rather light. Humor. Lots of intentional and unintentional humor. Brevity. You can pop in out of super stories relatively easily compared to Star Trek. Longevity. Supers have been around a long time. Nostalgia. Most kids aren't exposed to Star Trek till they're much older whereas with supers, you probably had a favorite growing up. I just like individual heroes. I'm not as fond of guys who are part of a homogeneous team. Give me a single guy with laser vision over a bunch of guys with energy rifles. Or a one-man army trying to defeat his foes on his own over deputized agents who are bound by red-tape and prime directives. And I suspend my disbelief easier for that lone hero with the bow and arrow than I do for that SWAT team of guys with interchangeable modern weapons. I think that's the crux of the issue, Jon Clark. The superhero is a lone gun fighter or swordsman, going out to fight evil all by himself, which has been part of our mythos for untold millenia. And many of my favourite stories do involve a superhero going off by himself. Despite my onscreen name, my favourite hero is Batman, but even Hal Jordan was often a lone green lantern, despite being a member of a corps. After the last two years, I can say, without hesitation, I would rather have the opportunity to live in a utopian society. The Chinese have a curse, "May you live in interesting times". We fantasize about living lives that we would never want to go through - who wants to lose his parents, get traumatized, then put on a mask and risk his life beating up on criminals? I'm a fan of both Superheroes and Star Trek and have been since I was a kid. I've also read Star Trek comics and tbh, the quality is not that good. I think if they can get decent artists and find a writer that doesn't bore you to tears it could really take off. Yeah, for all of its output, IDW's offerings have always been mediocre at best. I think the last time I truly enjoyed ST comics was when Wildstorm was doing them briefly in the early 00's. Yeah, for all of its outpur, IDW's offering have always been mediocre at best. I think the last time I truly enjoyed ST comics was when Wildstorm was doing them briefly in the early 00's. 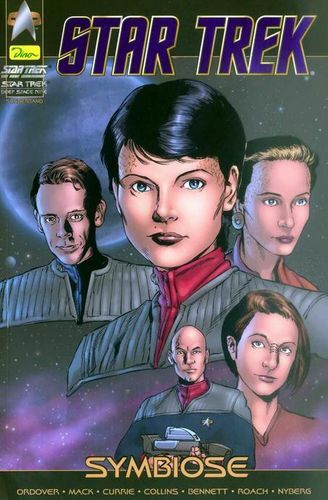 I gave Wildstorm's TNG a try and granted the art was a lot better than the DC TNG comics years prior and the stories were an improvement. Now DS9's Marvel and Malibu comics were better in art and story and Garak was allowed to be the pansexual man that Andrew Robinson wanted to portray him as when he was introduced during his meeting with Bashir. Shortly after Robinson was asked to tone it down. The comics writer and Marvel didn't seem to have the same concerns as Paramount. The book still had its problems, though. 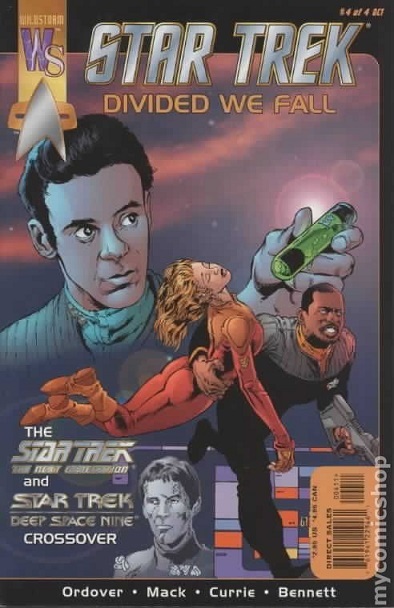 I bought the Devided We Fall DS9/TNG crossover comic and liked some bits and the art was pretty good. It expanded on the Ezri Dax/Julian Bashir relationship that we only got a glimpse of in the final season of the show (and of course they break up later in the novels for realism as usual). But I can't help but think it could have been done in 1 issue. It was just stretched out too long with not much going on, really, to warrant 4 issues. I really love the art here. The artist was able to make them look exactly like their show counterparts while still being comic art. Past attempts of actor/actress likeness were very stiff IMO and just didn't have the boldness that comic art should have. The writer also seemed to have a good grasp on the characters. Now when IDW announced a comic that would focus on Data's return and a DS9 mini-series I was so happy. Because IDW has had a good track record of adapting loved tv/film properties successfully. But, that was not the case with these. Suffice to say Data's return and Fools Gold was, like many previous Trek comics, extremely boring. Even more boring then prior attempts and I didn't think that was possible. How the hell did IDW get this wrong? Usually what they touch becomes gold. IDW and Trek should have been the perfect match. I think Trek has handled the heavy themes 100x better than the best super hero stuff to date. Trek, despite its hundreds of hours of broadcasts, is far more focused than superhero comics. With a variety of style, titles, and characters, superhero comics can't focus on anything excpet that they're all kinda superheroey. That leaves a lot of superhero comics that don't even try to hit the focus Trek was taking. And those that did were the result of many sources. Some actually did a good job of covering heavy thems. Others not so much. Everything has its crap. Look at TOS season 3 and Star Trek V.
As to why we might prefer Superhero comics to trek, I think superhero comics expand the imagination more and put us into the picture better than a story set hundreds of years in the future. I'm a fan of both and although I like a greater percentage of Trek than I do superhero comics, I can't really pick which I like better. But both can use more intense themes disguised in a science fiction motif. Superhero comics just don't always do that. I love both pretty much equally. Star Trek was my first love and superheroes probably came not too far after, but I'm not sure I'd really agree with that. Star Trek can be very heavy handed and even when I agree with the message, which is usually, it can be pretty cringy. Everyone likes to bring up the episode with Frank Gorshin where it had the people with the black and white faces and it showed the silliness of racism. It's a great message... but the episode handles it with about as much subtlety as a marching band. Most of the other message episodes don't get better. TNG usually attacks messages from a place of such arrogance that I sometimes find it hard to agree with their conclusions even if I agree. That's not to say they're all like that, but I find most of the people who really like to focus on the heavy themes of Star Trek often times don't really watch Star Trek. Superheroes aren't perfect either and maybe even worse than Star Trek on a regular basis, but when they hit, they hit. Most superhero comics are 'me' fantasies. Batman does X. Spider-Man does Y. As such, superheroes make for a good selfish sort of personal power fantasy. Daredevil fights alone. Superman *can* be part of the Justice League, but I can also read stories in which he stands alone against various forces of evil or threats to Earth. If I don't want to read a team book, I don't have to, I can read about the adventures of one single person, making a difference, and that's a different taste. I personally prefer team books, sometimes about younger heroes, sometimes adults, sometimes the elder generation (Legion of Super-Heroes, Teen Titans, Young Justice, Justice Society, etc. from DC, Runaways, Agents of Atlas, New X-Men, Avengers Academy, etc. from Marvel), and also am a bigger fan of Star Trek (which feels more '*we*' oriented and 'the whole team won' than, say, Star Wars, where the single very special chosen person with the most Midichlorian junk in their trunk wins the day), but I can see how the 'me' team has it's appeal, with characters who aren't just a cog in a wheel and don't have to share the glory. That said, even Star Trek has it's 'me' episodes, particularly when Kirk is involved, as he sometimes ends up alone saving the day. The classic episode with him vs. the Gorn captain would be a fine example, as it might as well have been a Kirk standalone story, with the crew forced to watch on TV as he fought alone. Last edited by Sutekh; 03-11-2019 at 08:53 AM. I actually enjoy both superhero comics and star trek. What's not to like? One is highly simplistic entertainment with daddy wish fulfillment fantasies focused mostly to market more toys. The other is more nuanced & doesn't hide from complex & thought provoking issues. Star Trek toys have always sucked & displaying them makes you look like a super-nerdy tool.